The Delaware River Port Authority finance committee has approved a measure that would reduce tolls for regular bridge commuters between New Jersey and Pennsylvania. 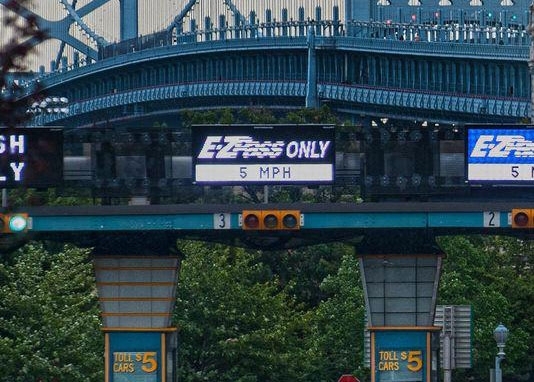 Drivers who use the Benjamin Franklin, Walt Whitman, Betsy Ross and Commodore Barry bridges at least 18 times a month would see the toll drop from $5 to $4. This could save daily commuters over $200 a year. The discount would be calculated automatically on your E-ZPass bill. This proposal would affect 29,000 drivers. The measure now goes to the DRPA's board of commissioners who will vote on July 15th. It would go into effect later this year if passed. The body of a teenager who went missing while swimming in a lake in South Jersey on Wednesday was recovered today around 1 pm. 17-year-old Darius Boyer was found dead in the lake at Jackson Road near Piney Hollow Road on State Fish and Wildlife Management property in Monroe Township, Gloucester County. Boyer was swimming with three other friends around 4:00 pm yesterday when he went under and never resurfaced. Crews began searching yesterday and resumed this morning. Boyer was a senior at Williamstown High School. The owners of the popular Ocean City, NJ boardwalk landmarks Manco & Manco pizza have pled guilty to tax evasion and lying to the IRS. 55-year-old Charles Bangle and his wife, 54-year-old Mary Bangle were charged last year with under reporting income and avoiding detection between 2007-2010. In 2010, Charles omitted over $250,000 in income and avoided $91,000 in taxes. He also made structured cash deposits to personal bank accounts of under $10,000 so the bank would not file reports. He faces 5 years and $250,000 fine for the tax evasion count and 5 years and $250,000 fine for the structured payment count. Mary faces 5 years and $250,000 fine for lying to IRS agents. Sentencing will be October 8, 2015. The Bangles were employees of Manco & Manco (formerly Mack & Manco) and purchased a controlling interest in 2011. There are three stores on the boardwalk in Ocean City and one in Somers Point.